Like I said in my bio, I am just an ordinary person minding my own business and living my own little life. How would I get on a scammer’s list of possible victims. Do they just pick people from a brown paper bag? Do they research to see if you have a computer , or are a senior and vulnerable? Well, in any case, I got on their list. The other day someone called (a woman) and proceeded to tell me that she was calling from Windows tech support and she wanted to let me know that my computer had been compromised by some very malicious person, and needed me to go to my computer so that she could help me fix the problem. This of course made me nervous and suspicious. I told her I had a virus check on my computer and she told me that this had nothing to do with a virus, but that it was a very harmful and dangerous thing that they were doing to my computer. I was suspicious but at the same time wondered if she was being sincere. As I listened to her talk, I could hear many voices in the background, making it sound like a call center. I then started to ask her questions. Where was she calling from, and what was her name and phone number? She gave me the name of Jane and said she was calling from Canada, and still insisted she was calling from Windows tech support. I told her I could not get to my computer at the moment, but I would take down her number and give her a call back. My husband was in the room so I explained to him what the call was about. He said that we should call the Better Business Bureau and see if they knew anything about this type of call. The young lady that answered the phone said she would try and help me, but she sounded like a novice at this kind of question, but she did indeed try to find some information for me. After a few minutes of talking to her, a co-worker of hers, evidently could hear our conversation and told her that it was a scam and that the Windows people would not ever telephone you with this kind of problem. Afterwards I felt a little silly for almost believing in this person, but she sounded so convincing and I was caught off guard. These people are vicious and have no shame enticing innocent people to do harm to their lives. If you go on the internet you’ll see that there are scams galore; internet scams, telephone scams, Craigslist scams, door to door scams, and the list goes on and on. So who are we to trust? Is there a list showing us who we can trust? Well, I’m thinking that if there is any doubt, no matter how small that doubt is, don’t do it! Talk to someone first before you make that move. I’ve strayed quite a bit from my agenda for this blog, but felt this needed to be posted to warn people again. Always listen to your heart first, not the greedy monsters that are after our innocence. Even though the start of autumn was a whole month ago, we haven’t really experienced anything but great weather. But, last night autumn gave us her grand change-up. Starting with the wind waking up the leaves and then had them working hard to stay on their little branches. Then the rain came and gave them a rough scrubbing. We could hear our wind chimes making their music and that’s what we fell asleep to. We need the rain desperately in our area after all the heat and dryness we experienced this past summer. Yay, it’s time for hot chocolate and marshmallows. 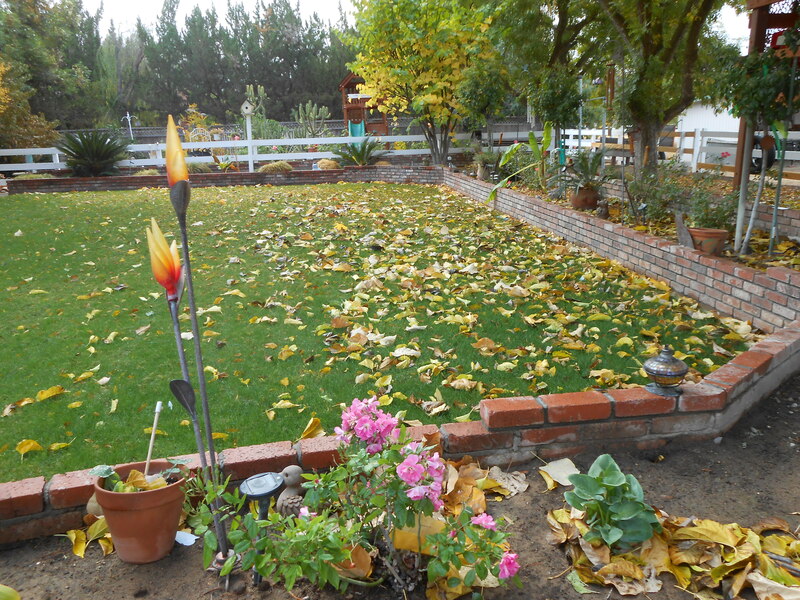 My ranchito is such a joy to me in all seasons, but autumn is so enjoyable because the weather is so fantastic. 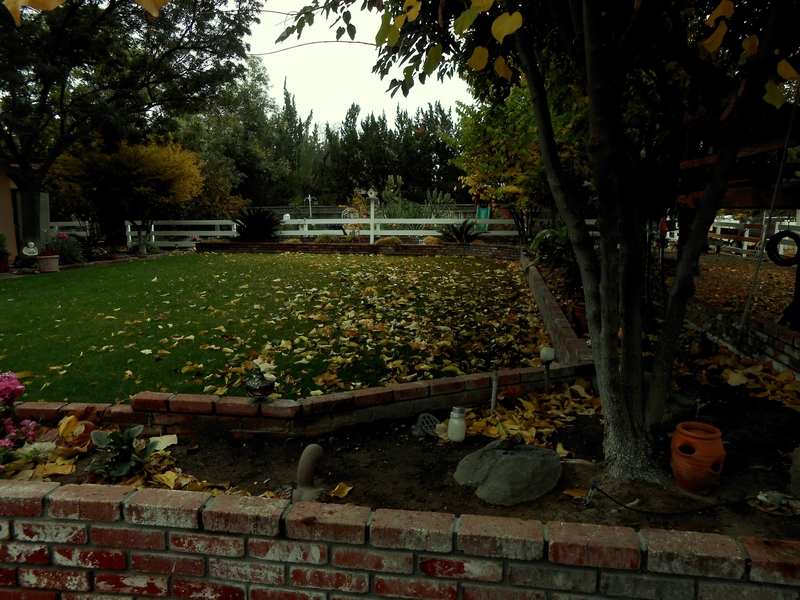 If you have ever experienced a summer in the San Joaquin Valley in California , you know why I’m in love with our fall season. Take some time to enjoy autumn! The day of the apron. Many years ago women wore aprons for cooking, and cleaning, now, not so much. I remember my mother wearing them all the time as she worked in the home. 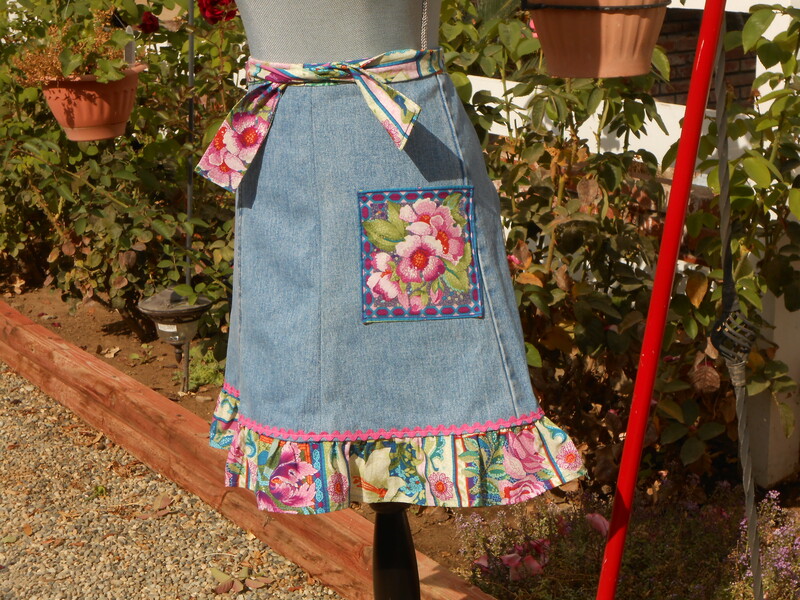 Now aprons are more of a decoration, and I have seen some lovely ones on Pinterest. At one point I was making aprons from recycled jeans, so I decided to participate in a craft show , and thought that my aprons would be a big hit. Well they were a big hit, in a way. The people gave me many compliments and examined them very carefully, but then never even bought one. I could hear them trying to figure out how I made them and tried to guess what part of the jeans I had used. But still, not one person bought a single one. One person came back twice and looked at a certain apron. I could tell she was debating on what to do, well she finally walked away without the apron. Disappointment turned into anger, but then I realized that I did the very same thing when I attended craft shows. I’d always examine the item very carefully and then I’d say, ” Oh I can make that.” and walk away. Actually, I still do this. Well I guess the old saying is true; “What goes around, comes around.” Lesson learned! 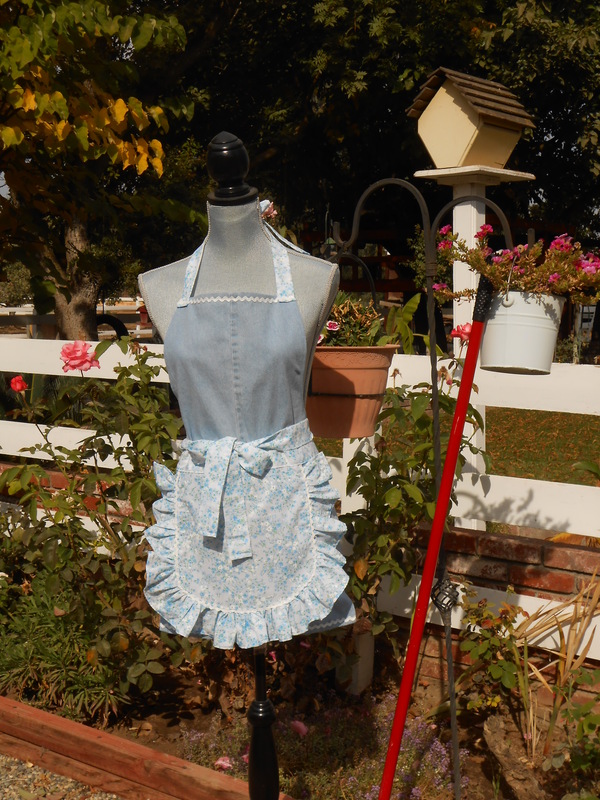 But I’m not going to be discouraged and will now continue to make my aprons and see if I can do a little better. Who’s hanging out in the garden? Lupita felt like sitting in the sun for a photo shoot. 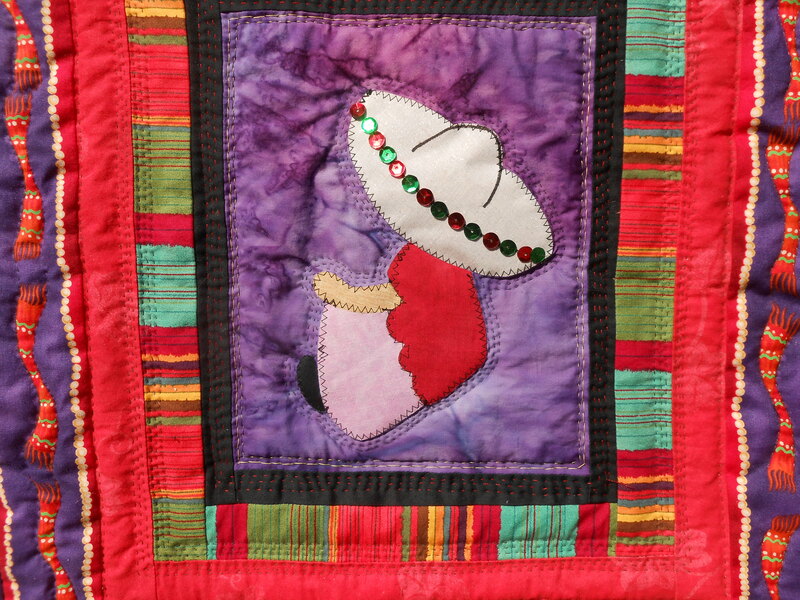 This quilted wall hanging is a take on the Sunbonnet Sue pattern, but because I am Mexican-American, I thought a sombrero would suit my identity best. As you can see, I love the use of bright colors, mixing the reds and purples. I am not a traditional quilter. I do what pleases me and although some quilters might cringe at my designs or sewing, I believe that’s what quilting is all about, showing your own personality and creativity. In my world of sewing there is no wrong! So, get going and do your thing! Here’s my Lupita, amongst the cosmos and a close-up of her. She did ask for some bling on her sombrero so I used some sequins on the rim of her hat. At the moment I am in the middle of another project for one of my nieces. 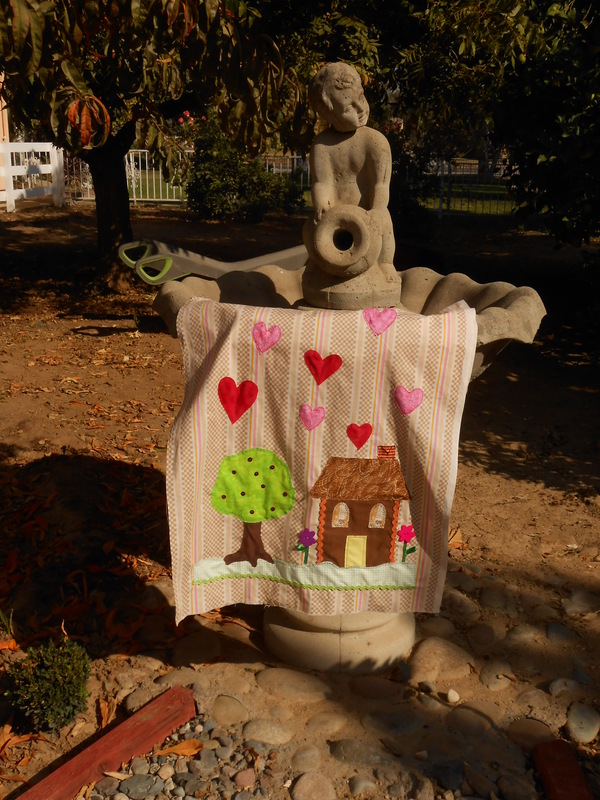 She lost her baby at childbirth so I’m making a wall hanging in memory of her baby. I’ve talked to her about it, and she was very excited. 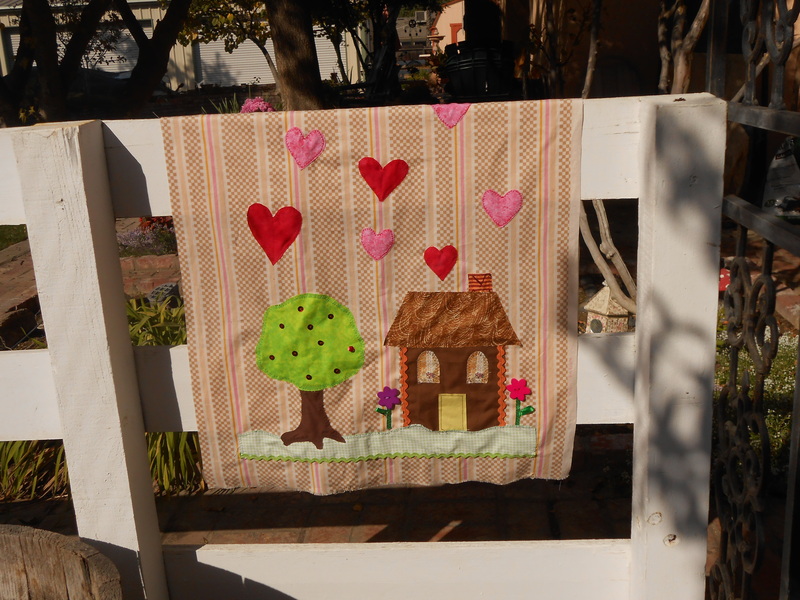 It will be a happy, colorful quilt and hope that it will bring a smile to her face. A picture will follow later this week. P.S. I would like to explain my blog title to those of you that don’t read Spanish. It means, my little house, my little ranch. When I told my daughters the title they asked, what’s that? Yes, shame on me for not teaching them the Spanish language, but there is a reason, although some might think it’s a weak excuse. I might explain at a later date. This week the focus is on my garden, because it gives me great pleasure and peace. This is what my garden looked like in the spring. Since I’m not even a little smidgen of a gardener, I choose plants that will give me an easy time. Geraniums are my favorite, along with dianthus, ice plant and cactus. Every morning I walk this little pathway, that my husband made, to check my little flowers. 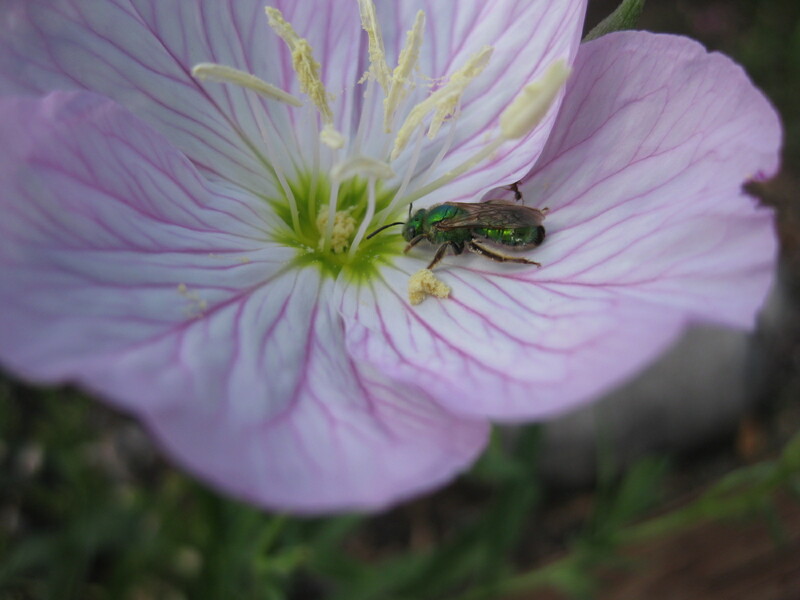 Cosmos are another favorite and blooming beautifully at the moment. And of course this is my Mexican primrose which keeps on giving and doesn’t give up until it has choked all its little neighbors. I love the green fly, such a pretty color. Is it a fly? Yes, I have finally given birth to my blog. Many months of thinking and rethinking whether or not to blog and I finally decided to take the leap. I’m hoping to share my thoughts and any handiwork that I have accomplished to any and all that might be interested. I have sewn most of my life, making my own clothes and then making clothes for my daughters. Now, I enjoy quilting and creating my own ideas for the quilts. I also do some gardening and by no means am I an expert at it. It’s all trial and error. Today, I planted some snap peas. My youngest grandson likes to pick them off the vine. So here’s hoping they come up. 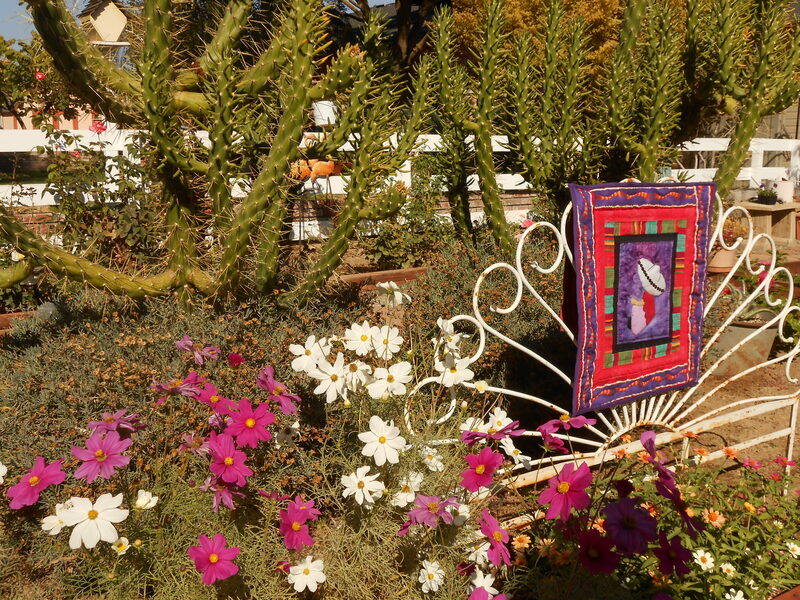 Please join me as I learn how to blog and make it interesting for all of you that read, Mi casita, Mi ranchito, and please, I welcome any comments that are constructive and helpful.